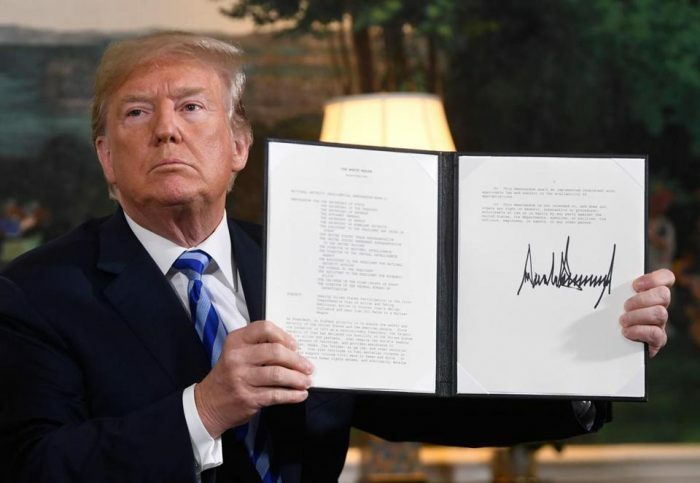 With a quick flourish of his pen, President Donald Trump withdrew the U.S. from the 2015 Iran nuclear deal and signaled the end of the waning influence of the Iran lobby on U.S. foreign policy. Administration officials said the Iran sanctions suspended under the agreement snapped immediately back into effect, meaning any new contracts and financial deals are banned. They said businesses and banks have either 90 or 180 days to wind down existing ties, depending on the particular type of transaction, according to the Wall Street Journal. Because of the dominance of the U.S. economy on the global stage and the reach of its financial markets, as well as the status of the U.S. dollar as the world’s currency standard, the effect on the Iranian regime will be devastating no matter what European leaders attempt to keep Iran afloat. Already the Iran lobby has howled like a pack of mad dogs at the president’s move. Trita Parsi of the National Iranian American Council sounded the familiar war refrain as he claimed the move sets the U.S. on a path to war. “Donald Trump has committed what will go down as one of the greatest acts of self-sabotage in America’s modern history. He has put the United States on a path towards war with Iran and may trigger a wider regional war and nuclear arms race,” Parsi said. It’s a moronic statement since the U.S. is obviously not gearing up for war. There is no military build-up. No aircraft carrier battle groups are steaming for the Persian Gulf. The lack of any U.S. military activity is conspicuous. The president has been forceful in speaking out against the Iraq invasion and against long-term U.S. foreign commitments, preferring to focus on domestic matters. In his mind, after granting several extensions to the deal giving European allies several months to work on a compromise addressing his concerns, he finally concluded that the only party not interested in changing anything were the mullahs in Tehran. But that hasn’t stopped the Iran lobby from spreading its falsehoods like fertilizer in the hopes of resurrecting its fortunes, but not even recruiting for Obama officials in a last-ditch effort to save the nuclear deal made a difference because the Iran lobby could never address the real concerns the president had about Iranian regime’s support for terrorism, development of ballistic missiles and crushing human rights abuses. It didn’t help that the mullahs cracked down by banning the instant messaging app Telegram and snatching yet another British-Iranian dual national citizen with no reason given adding to the large number of hostages the regime seems intent on stockpiling. In his remarks in the Diplomatic Room of the White House, President Trump spoke directly to the Iranian people, recognizing their oppression and the lack of a government responsive to their needs. His words made plain that his actions were aimed at the mullahs and Revolutionary Guard Corps that backs them rather than the Iranian people who have been engaged in massive protests to this day against their government; most recently taking to the streets to protest the Telegram ban. Mrs. Maryam Rajavi, the president-elect of the National Council of Resistance of Iran, a coalition of Iranian dissident and human rights groups, addressed a rally in Washington this past weekend opposing the regime in which she correctly pointed out that since the Iran nuclear deal never addressed core issues making the regime dangerous to the stability of the Middle East, the action taken by the president was inevitable. “Regarding the billions provided to the regime in the framework of this deal, I said that the money poured into the regime’s coffers must be placed under strict United Nations monitoring to ensure that it addresses the Iranian people’s urgent needs, especially the unpaid, meager salaries of workers, teachers, and nurses, and is used to provide food and medicine to citizens. Otherwise, Khamenei will use these funds to further the regime’s policy of export of terrorism and fundamentalism in Syria, Yemen and Lebanon,” she said. The fact that the Iran nuclear was never submitted to the U.S. Senate for a vote as a treaty, but instead as an executive order and one of dubious legality, its erasure by President Trump was swift and simple. The Iran lobby argued for this course because it knew it would never survive a Senate confirmation. Bret Stephens, opinion columnist for the New York Times, argued this same point in an editorial and pointed out how supporters of the deal continued to get everything wrong about it. “Apologists for the deal answer that the price is worth paying because Iran has put on hold much of its production of nuclear fuel for the next several years. Yet even now Iran is under looser nuclear strictures than South Korea, and would have been allowed to enrich as much material as it liked once the deal expired. That’s nuts,” he writes. All of which adds up to a simple truth: the Iran lobby has reached the end of its effectiveness in influencing American public opinion and that President Trump has recognized that the Iranian regime can’t be trusted and must be dealt with forcefully and with open eyes.